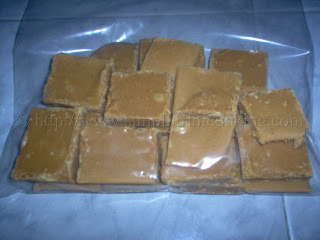 Have you ever had brown sugar fudge? I grew up eating mostly homemade sweets and candies. My mother would spend hours in the kitchen cooking, preparing these delicious sweets and candies that I love, such as: tambran (tamarind) ball, (coconut) sugar cake, nut cake, paw paw ball, toolum, fudge, chilli bibi, and bene ball. I remember well for harvest day, back in the day, these were the only sort of candies you would be able to buy from the sweets stall, not the commercial stuff we see today. Just in case you were wondering about my dental health, back then, strange as it may seem, I didn’t suffer from any dental caries. But now the stuff children are fed has so much artificial flavouring, it’s like eating a piece of “toothache waiting to happen”. All the local sweets and candies are still popular today, some more than others, but they’re still around and loved by many (including me). So when you want to reminisce on your younger days next time, have a piece of fudge. All you need is one taste to take you back to when granny used to make. Butter a dish and put aside. 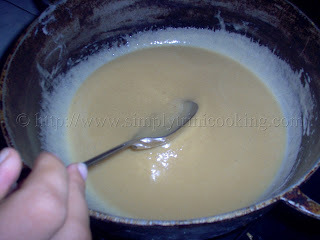 Put butter in a saucepan or pot over medium fire to melt. 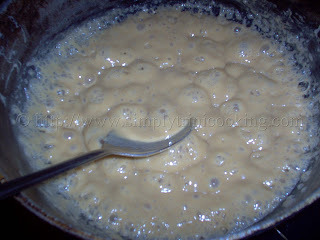 When the butter has melted place sugar and milk and stir gently and constantly until mixture becomes golden brown, leaves the side of the saucepan and thickens. Test the candy (the heat should be lowered slowly while you test the candy). To test the candy, drop a ½ tsp of it into some water. 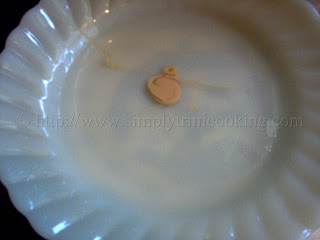 If the tested piece forms into a firm ball remove the sauce pan from heat and immediately pour into the buttered dish. 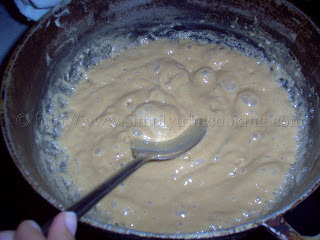 Shake the dish to make sure the mixture levels out. 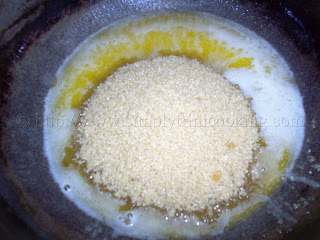 Allow the mixture to set for about five minutes. Mark into squares and allow the candy to cool. Enjoy and please brush your teeth when you’re finished! I saw this here last week and made it today. Something my mother made when I was a kid and I had forgotten all about it. I’m glad you liked it. Come by again soon! Just made this! It was great! It was my first attempt at making fudge and it worked! Thanks! 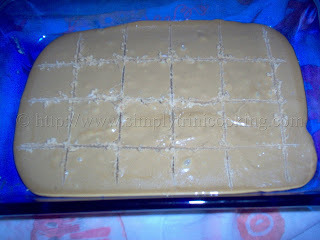 Fudge takes a little practice to get it at the right consistency. Make sure to use the water test to help you. It may be possible but it is a lot easier to use the condensed milk. 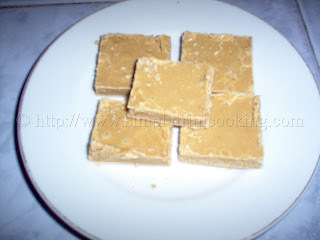 This is what Guyanese call ‘peera’; mine always comes out perfect, but it’s so simple to make anyway. And I always add vanilla and sometimes I embellish it with flaked almonds. But of course, it’s perfect on its own. Bye! You’re right, Peera is something totally different. I tried this recipe and failed. I used most of it doing the water test. 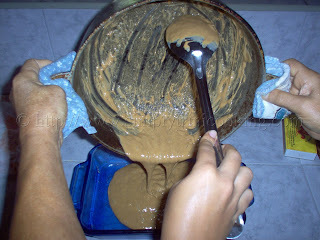 The remaining mixture turned out like toffee. You were absolutely right to warn about the toffee error. I will try it again this weekend and hopefully mine will look as wonderful as the pic above. Can you tell me how long to stir the mixture on average. That way I may avoid making another batch of toffee. Hey I tried this and failed. Yours looks like the fudge I remember eating back home. I need some help figuring out what went wrong. I followed the recipe exactly. The only thing I can think of is that I used dark brown cane sugar by domino instead of the regular Demerara brown sugar. Could that be the mistake I made. It came out looking gritty and clumpy instead of smooth. Also while bowling the mix I noticed that the oil from the melted butter was separating from everything else. Can you please help? I would love to make this for my kids. Ok I tried it again and this time the ball test came out fine just as is shown above. Then I quickly poured it into the pan as you stated. However, the fudge didn’t set at all. It remained sticky like toffee. This is after I did the ball test and I used a candy thermometer to be on the safe side. Is there an additional step that I”m missing in the end? When I check other websites they state to beat the fudge until it thickens like peanut butter and some of the gloss is gone. 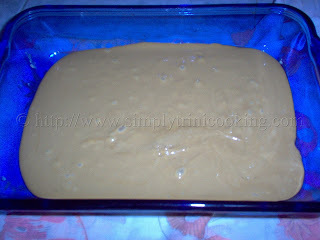 Well I had a glossy top and the fudge consistency was like toffee so I’m guessing that maybe I need to beat the fudge after removing it from the stove before placing it in a dish to set. Will that help? Yes, butter is still used as a base. For the coconut milk it is best to use milk from a freshly grated coconut. If not, you can substitute with coconut milk powder. Hope this helps. Hi u Said that when the butter is melted add sugar and milk and by milk u mean condensed milk? Right? Hi. Approximately how long does it boil for? Is it a rolling boil the whole time? Thanks. I have no idea of the time since it was not recorded. Just follow the instructions like many others have done and have been successful. Hi, can I use coconut oil instead of butter? What’s your best guess?